This website and the accompanying posters have been designed by Nabaa Baqir, Mila Spasova and Serhan Curti, 2nd year design students at Coventry University, as part of a project on performative publications run by Janneke Adema. They offer a different take on the article ‘The political nature of the book. 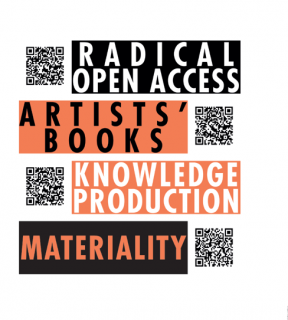 On artists’ books and radical open access’, written by Janneke Adema and Gary Hall and originally published in the journal New Formations. This website consists of 3 sections that all offer an alternative way to engage with the article, as well as to access or distribute it. The first section consists of the original postprint article text, which offers a familiar linear reading experience. The second section consists of 28 keywords, which relate to some of the main themes and topics that characterise and structure the article’s content. By clicking on them these offer an alternative non-linear route through the text, as they are connected to snippets of text extracted from the original text that refer to the various keywords. The third section offers an offline engagement, consisting of 7 posters, each with 4 keywords and 4 QR codes that can be printed off at home. The QR code for each keyword will direct the reader to the corresponding keyword on the website, offering them the availability to access the various text snippets through their mobile devices. The posters can be printed on A3 or A4 format, which makes them easy to access with the aid of a home printer and simple to disseminate. On the backside of each poster you can find all the 7 separate posters in a reduced size with the accompanying keywords and QR codes. The poster can then be folded in such a way (see the folding instructions) that it forms a little booklet consisting of all the posters via which the entire article can be accessed.